Here you find the latest updates of our Solar Journey. In our posts, we will not only update you of the latest developments in our project, but also include some interesting facts about renewables, electric vehicles and energy storage. Please subscribe to our newsletter if you want to be notified of future news items. November 16, 2012: Sandy Relief with the Sun. October 22, 2012: Winter hibernation and beautification. September 23, 2012: Day 1 and 2: FarmAID and National Plug-in Day! September 16, 2012: Driving Congress Green! August 15, 2012: Test trip coming up! August 6, 2012: Electric Avenue! July 25, 2012: Construction progress. During the two months after Sandy happened, we've provided power to a distribution center for food, water and other supplies at the St. Gertrude Church on the Rockaways. The flooding didn't just take out the power grid for about a month, it also destroyed breaker panels in people's homes, resulting in the effective power outage to take even longer for most households. Fuel for generators was in short supply for two weeks, putting alternative energy sources like solar in the spotlight... Our work was posted in the Washington Post, SmartPlanet.com, CarTalk, Inhabitat.com, and even televised in Ireland!! On Thanksgiving eve, our giant bumblebee trailer provided power to the Church's auditorium where about a hundred people came together to eat their turkey dinner. After the Church had their grid-power back on, we wrapped the system up and left it there for the winter. Until last week... Because we were contacted by our friend David Gibbs to set up the array for a MoMa project on the Rockaways. A big geodesic dome was set up on Beach 98th street, which would house a small cafe and an art exhibition about Sandy. How could we possibly refuse to become part of this cool project? So last Saturday, we went out to pick up the trailer and move it to its new location. It was a beautiful, sunny day and we were given a great spot next to the dome. People were immediately attracted to the dome + array and wanted to help set it up. So what about the Solar Journey trip?!? Our plans to make the trip last Summer didn't pull through because of the lack of an EV. We were happy we did a small version of the trip on the East Coast together with a group of EV owners, where we successfully charged a Tesla Roadster and a Scion EV. So the proof of concept is done, but we still don't have an electric car to do the full trip... We've reached out to all EV car manufacturers we know, but without positive response so far. Hopefully we hear from some others soon with better news, because our PhD time is running out... Garrett got a job!!! Title: Sandy Relief with the Sun. We've all seen the destruction Sandy brought to big parts of New Jersey and New York, the TV news covered pretty much all of it. However, thousands of people are still struggling to survive two weeks after it happened, perhaps not covered by the media as much as it should be to bring attention to the rest of the community. On Rockaway Beach, probably one of the areas struck hardest by Sandy, 90% of households are still without power. Some people can afford a generator and have fuel brought in once a day, but the majority of Rockaway residents don't have the money for this, or their houses were simply washed away and there is nothing to power anymore. Most households have their electricity combiner boxes located in the basement (which got flooded), so even if the power grid goes back on, it will take some time before every individual combiner box is replaced. The site is next to the St. Gertrude church and Youth Center on Beach & 38th street. After the hurricane, a volunteering center was set up here, where donated goods are brought in and distributed. Our PV system is now set up and providing power to lights, refrigerators, computers, phone chargers and the temporary medical clinic set up in the church. A much better use of solar than letting it sit in a storage facility, isn't it?!?! When we drove down to Rockaway Beach on Wednesday night, we were amazed by the destruction Sandy brought to the area. There's a curfew at night, so we were basically the only people out on the street, except for some surveilling cops. Without people and electricity, the place looked like a ghost-town. We arrived at 1am, but walked around until 4am to simply look around and take pictures. Wow... houses are completely swepped away, parked cars were relocated by flotation, power lines hanging down vertically from the electricity poles, the boardwalk from the beach deposited in the middle of the next street.. This event will take Rockaway months, if not years to recover. This was a historical storm. Records were set on high tides in the area, 3 feet above hurricane Donna in the early 20th century. After the water retreated back into the Bay and the Atlantic, it left an enormous amount of mudd and debris on the roads. This was one of the first things to clear out, preparing the infrastructure for relief efforts. Renee, a volunteer helping at the St Gertrude church, told us that it was difficult to drive, since you couldn't tell where the road was. Right now, the streets are fairly clean, but many cars are still in awkward places. Best way to get there and volunteer: take the A-train to Howard Ave or Jamaica Station, then transfer to the shuttle buses. At the church, they need all the help they can get. Title: Winter hibernation and beautification. This weekend we had our last visit to Sussex,NJ for some time. While driving the trailer around during our FarmAid event last month we realized that rust was looking like it would be a serious issue for our system. The structural steel used for the PV mounting structure is very prone to oxidation without a protective cover, and leaving the system in storage protected only by a tarp during a north eastern winter would surely lead to a very rusty and 'antique' looking trailer come spring. So we decided a paint job was in order, not only to protect the metal but to give it a bit of fashion. This past Sunday we spent 4 long hours with a metal wire brush and a drill removing all the recent oxidation in preparation for the rustoleum application. After we got the steal as clean and rust free as we could manage we added our sunburst yellow oil paste paint to all the horizontal beams and a nice glossy black to all vertical members. The result was a Bumble Bee looking PV EV charging trailer, just in time for the Halloween weekend. The trailer will now sit unused in storage in NJ, such a sad thought to think of a perfectly capable 6.5 kWp system being stored for 6 months when it could be generating clean green electricity for anyone with space to host it. Now that the trailer is 99.9% complete we can focus on our PhD research for a bit and then in the early spring we will start planning for the summer trip that has now been postponed two summers in a row, lets hope we get it done this summer cause I think both Rob and I wont have too many summers left that we can just cruise across the USA. We charged an electric car with our solar array!!! Great news, it's nice to have reached this milestone after two years of hard work! This is not just a milestone for ourselves, but it's also something unique that (as far as we know) has never been done before... Yes, people have charged their electric cars while their rooftop solar array was generating current. But charging a commercially available EV from a mobile charging station has done before without being connected to the grid. It all happened at the Renew America Roadtrip event in Trenton NJ, where Michael Craner needed some extra miles for his Tesla Roadster. This car has a couple of charge-settings, ranging from 12A @ 120V (slow trickle charge with normal wall outlet) to 70A @ 240V (fast charge). 12A * 240V = 2880 Watts, or 2.88 kW. This means that the Roadster was absorbing more power than the solar array was producing... Impossible right?!?! Not with a battery backup on board the trailer: 4 Trojan Lead-acid batteries were making up for the difference. With all six layers deployed under full sun, we would've been able to charge at 24A, or roughly 5.7 kW and still have some 'leftover' power to charge the lead-acids. We also charged a Scion EV conversion car, built by AC-Propulsion and used for research purposes at the University of Delaware. They're doing pretty cool stuff there: connecting electric cars to the grid so that they can actually assist the grid in keeping the balance between supply and demand. 150 Amps.. this is not what these batteries were designed for. So right before we wanted to readjust the charging current on the Tesla, one of the battery terminals melted. Yes, we felt pretty bad after this. BUT, it was also a learning moment for us: think before you act.. Title: Day 1 and 2: FarmAID and National Plug-in Day! With pleasure we would like to announce the first two successful outreach days of our Solar Journey! We are typing this update from our hammocks in an RV park in Pennsylvania! It has been an epic 2 years from having the idea to the completion of the trailer and now these successful days. Here's a brief summary. Friday, one day before the actual event, we arrived at the Hersheypark stadium in Hershey, PA (where the Hershey's kisses are from) and set up our solar trailer in the Home Grown Village (a section all about home grown food). We were given a site next to a tent where people had their information booths. During the setup, we were approached by several other exhibitors who were interested in using our power for their booths. A couple of extension cords were plugged into the inverter and within no time we were providing power to all booths in the tent! How cool is that, they were doing home grown food, we did home grown electricity!!!! The weather forecast for the next day looked grim. It said 'Precipitation 100%'. Obviously, this was not something to look forward to if you're operating a solar power station. After camping overnight at an RV park nearby, we went back to the trailer for the actual FarmAid event. The weather? AWESOME. No rain at all and hardly any clouds! The mood was great, music good, and the people amazing. We did not expect so much interest and Wows that day! We recharged people's phones, explained how the system works (to some more technical than others). 1) How big of an array would I need to provide all electricity for my house? - A small household consumes about 7,500 kWh per year. With 5 full sun-hours per day you would need an array of roughly 4 kW to offset that electricity. 2) How much would that cost? - Solar power is getting cheaper every day. Right now, residential scale systems are being built for roughly $4/Watt, which would be $16,000 for a 4 kW system. The mobile solar PV system is working!!! We took it out to Randalls Island and hooked all the tables up to our charge controllers and inverter... The empty parking lot provided us with enough space to deploy all 12 tables and generate some clean electricity. Yes we know we parked it in the shade: we did this because the array doesn't need to be in the full sun to test if it works. Besides, it's bad for the panels to be out in the heat without generating power (here's a cool paper by First Solar on the topic). With the panels in the shade, we still generated little over a kilowatt of power, roughly one-sixth of the total PV capacity we have installed. The three MX-60 Outback charge controllers worked perfectly in parallel on the same battery array, which comprises four 12V Trojan batteries in series. Here's a diagram of how things are wired together. After generating power for about 15 minutes, the charge controllers started moving off the maximum power point, a process that happens automatically as the batteries reach a full charge. We also tested the inverter's capability to provide 120 Vac power (like a standard U.S. outlet) by hooking up a small sound system. It worked! This reminded us of the small system we had built about a year and a half ago when we first played zero-emission music!!! Now that we've tested the solar PV system, it's time to see if we can actually recharge an electric car with it.. So this week, we're participating in a cool event called 'Driving Congress Green', where EV owners drive congress members around in their electric car, to show them how awesome EVs are. A perfect place for me and Garrett to show that these vehicles can also be charged with green electricity. Everyone is welcome! Please visit the Renew America Roadtrip website for the schedule. Special thanks to Michael Craner for letting us join the event! We are also planning on being at the annual FarmAid concert at Hersheypark Stadium, PA. The concert features many top music artists (Jack Johnson, Willie Nelson) to promote family farm grown food in the United States. We were asked to bring our PV system to show how Americans can generate home grown electricity! New update soon! Stay in touch. In the last post you saw we were finalizing our construction in the basement. The sponsored First Solar panels were fixed to their 'tables', Outback Power junction boxes were placed and yes, we drilled more holes!! But the result is here! We built a 6.5 kW mobile charging station! Garrett in front of the mobile charger at Columbia. One of the tables of solar panels is still on the ground. Last Sunday, we took the whole trailer apart and brought it back to the shape it was when it came into the garage. Why? Simply because the garage door was not high enough to fit our construction... Many people thought we made a mistake by bringing the trailer in there, but in fact, we knew this all along AND without all the equipment we had access to from the Formula Student SAE guys, all of this wouldn't have been possible. Thanks for being our host guys! To get the trailer out, we rented a U-Haul truck and had our best friend Kyle help us guide the vehicle up. With literally 4 inches of space on each side of the trailer, it was quite the challenge (video watching is recommended). Special thanks to Cornelius for great camera work in the last video! After we took it up, we brought all the solar panel tables outside too and re-assembled the vehicle, which took until 11pm. It was then moved to a lot on 115th street where it's waiting for some batteries, circuit breakers (hopefully tomorrow) and then we will have it checked up by our PV-expert David Gibbs before we flip the switch. I hope you like reading these short blurbs. Tables put together. Each table has six FS-390 panels, producing 540 Watts. Times 12! Right: Frames for the tables layed-out to show the size... This made it easier to size cables (see video below). Construction is moving along... Although time is ticking, and the sun is slowly moving towards the southern hemisphere. This week, we have to move the trailer out of the basement because the schoolyear is starting. In our new - to be determined - location, we have to put the finishing touch on our trailer. Anyone you know with space outside the city? NJ? We're looking for the golden tip!!! We have also exploited some of Garrett Spiderman skills while working inverted on Outback's inverter. Another activity: Last week was the Columbia Alumni Event. We were asked to put up some panels and explain to people how it works. It was a lot of fun! Many kids were around who were all super interested in the solar panels. One kid said (upper right pic): "So why don't you take a big mirror and shine more sun on the panels?" So awesome how kids come up with that.. And it would totally work, some companies do this! Here's a bunch of pictures and videos to show the progress over the last week. After putting up the main steel structure, we started mounting electrical components and other pieces of equipment. Attaching Caster wheels to the horizontal beams. Right: Awning beams that will hold 2 tables of 6 modules when deployed. One of our latest is the awning, that will hold 12 modules and provide shade for the people visiting the array. Below are some videos we made during construction. A lot of holes were drilled! But soon we start on the exciting stuff, installing modules and electrical components! Garrett testing the structural integrity of the SJUSA trailer. Over the past week we have been working long days in the machine shop using the milling machine, drill press and some other cutting tools to prepare the trailer for the journey. By now, our claws are permanently soiled with grease and filled with metal splinters. We did not have so much time to post updates to the website, although we did make a lot of pictures and videos. The FSAE (society of automotive engineers) student group has been kind enough to let us use their shop for construction and we have been making some good progress. We can’t imagine drilling all the 3/8 inch holes through ¼ steel by hand, the proper tools for the job really make things easier. Unfortunately we have had to drill all the holes into the trailer frame by hand which is quite intense and time consuming compared to the milling machine or drill press. Over 200 holes have been drilled so far and we still have a bit more construction to go. We have uploaded a few videos of us working in the shop and on the trailer explaining how the system is coming together. It has been really nice to see our idea go from hand drawing to small scale mock ups to CAD drawings and finally to the real life size steel trailer. We are awaiting a few more bolts form McMaster and First Solar and when they are delivered we should be able to finish up with all the structural parts of the system and move on to the more exciting and challenging electrical power system. We will keep you updated on our progress and hope to have the system operational within a week or two. We will be testing the system the second week of August and hope to depart to our firsts University august 20th. Day 5: Top level horizontal bars. Attach top table. MATE: system controller and display. Check out how these components connect together in our Electrical setup. This weekend we're starting construction in the Student Raceteam (SAE) workshop in our building at Columbia. First, the heavy steel uprights will be attached to the trailer, then the 'shelves' for the solar panel tables will be put together. We'll upload a video of our construction efforts! We're getting closer and closer to our planned departure period, and still have sooo much to do!!! Today, Tesla/Clipper Creek delivered a Level 2 charger to our office. It's armed with a giant plug and an inch thick cable, looks very much like what you're using at a fuel pump... It makes sense the cable is so thick: many amps will be passing through the conductor material inside! Also, last weekend we went on a roadtrip to North Carolina to pick up our trailer! It's a giant 20ft flatbed. It hardly fit into the Engineering Building basement, but it worked!! It's going to be even harder to take it out.. We drove for 12 hours with a car borrowed from one of our good friends and set up camp close to the trailer manufacturer. The next morning we had a special braking device installed, and visited Kaufman trailers to pick it up. On the way back we camped in New Jersey again to arrive the next morning at Columbia! That was around a third of the whole trip across the country! Also, all metal was delivered to the school so we're ready to get started on construction! We'll send a new update next week! In our last update, we talked about the trailer, Outback Power's potential sponsorship and our teaching sessions at the Bronx Design and Construction Academy. The trailer will be done next week and we're currently working on a marketing plan for Outback! Also, on a side note, check out the school's Green Roof integrated PV project (GRiPV). This is a project started by a fellow Phd student and good friend Marc Perez, who worked with Nate and his students on an experimental setup to show that green roofs and solar PV installations are not mutually exclusive, but in fact they show a synergy: You can have both over the same area and you will produce even more electricity from your array because of this. Two of the high-school students, Noel Cruz and Elton Hollingsworth presented their findings last month at the World Renewable Energy Forum in Denver. The presentation was very well received and an article was written on their story. After our project is done, we'd like to give some of First Solar's modules to the school so that they can use it for a more advanced solar PV courses in their curriculum. We showed you the design of the trailer. This 3D model is the result of a lot of brainstorming and many calculations. Once we figured out the size and setup, we built this little mockup with business cards, straws, cardboard and glue! This helped us figure out how the 'tables' of six First Solar modules are going to roll out and what kind of materials we would need for that. Next steps are to pick up the trailer, buy the metal for the system and start construction! Title: The Ball is Rolling!! Ok, so we wanted to give you followers another update on the status of Solar Journey USA and how progress is going with acquiring components and space. I'm very happy to report that we have primarily good news regarding both new sponsorships and construction space and it looks like with continued good luck we will be making the drive starting some time mid-July. We have recently been granted two parking spaces in the parking facility at the basement of Mudd Engineering building (unfortunately we are paying 184 bucks each per month) but we can’t complain because space at Columbia is hard to come by, even if we have to pay top dollar for it. However if you compare that to the monthly price for covered parking across the street from my apartment you find that $184 is really a steal relative to $500. Additionally we have been in communication with Outback Power regarding a potential sponsorship of the charge controllers and inverters for our system. Outback is a company that produces a multitude of components for both grid-tied and off-grid solar installations. Things look promising and we are just in the final stages of discussion with their marketing team, so keep your fingers crossed that we get them to join our party. We have been discussing a custom trailer design that will be manufactured by Kaufman trailers to our specifications. Rob and I had a few questions for the company regarding what the specs were on some of their trailers and to our surprise they were very friendly and willing to make the trailer to whatever specs we needed and even helped us in removing parts of the trailer that we would not need in order to lower the price. Really nice people there at Kaufman. So we will be making that purchase pretty soon here in the next few days. On a more positive note we have started our weekly lectures at the Bronx Design and Construction Academy. As you see in these pictures Rob and I are teaching high school freshmen about Sustainable energy technologies, renewable energy and electric vehicles. As you can see in the picture maybe Rob is a bit more of an exciting presenter than me, I swear only one of the kids in the picture is sleeping during my discussion. We have set up a weekly lecture, every Thursday where we teach one period of the freshman class of BDCA about sustainability, PV and EV technologies. We are new to this so we are learning how to talk to freshman level students about these technologies without going to far over their head while also keeping them interested. It has been fun!! Our first lecture at the Bronx Design and Construction Academy.. The car and trailer, with small overhang for shade. And here's a pdf file for the electrical setup. All of this will be discussed in more detail in the 'design' section of the website. In our last update we told you about First Solar’s commitment to become a Platinum sponsor, it has now been marked 100% official. Just a few days ago while Garrett was on the beach in Jamaica, two large pallets containing 72 thin-film modules were delivered right here to our office at Columbia University. We took them out in the sun to do some testing right away. Each FS-390 module is rated to produce 90 Watts of power, but the one we tested easily reached 95 Watts. People walking by were pointing at us saying: 'Wow, look at that giant iPad!'. Actually, it does look a little bit like an iPad, except it would be a little uncomfortable to use, with the module measuring 2 by 4 feet. Now the real work can begin with final designs and construction to commence in the coming weeks. Although we are still working out space issues and struggling with where we can store our trailer in the incredibly space-limited city of New York, we are very optimistic and excited to finally get our hands on these panels. This weekend we will visit a few flatbed trailer distributors and make our final decision on the mobile skeleton crucial to the portable power station. With the trailer and panels in our possession we are now able to make our final design plans. We spent the last year swaying back and forth between flexible and traditional panels, primarily as a result of sponsorship hardships, which made it impossible to lock down any real concrete design plans. Testing the First Solar modules.. These are exciting times for us here in New York, now that Garrett has returned for good we will be able precede full steam ahead with this project. Provided we run into no more sponsorship fallouts or other large roadblocks it looks like this trip will be set to take place sometime in late July. Of course we have a tremendous amount of work ahead of us, with design, construction, route planning and logistics. We plan on testing these panels in the next few days and bringing a few out on campus and doing a comparison between these and the Ascent Solar flexible thin film panels that you have read about in our past posts. If you’re in the area and want to see the panels in person, send us a note and we can let you know when we will be demoing them for the first time. It's been a while since our last update, but we have some good news! We are excited to announce that the world's biggest thin-film PV module manufacturer has come aboard Solar Journey USA as a Platinum Sponsor. The company has committed to provide the solar panels needed to power our trip across the United States. Besides that, First Solar brings in great expertise in the electrical systems and 3D-design, plenty of stuff we can learn from as well! First Solar is a leader in the solar energy industry for having the lowest-cost PV technology (~$0.72/Watt), having produced over 66 million modules (or: 5GW) and having the record efficiency CdTe cells and panels (14.4%). It also has the lowest Energy Payback Time of all conventional PV technologies (0.8 years*) and features a pre-paid recycling program (First Solar collects and recycles modules at the end of their lifetime, for free). First Solar: our new Platinum Sponsor! Fun fact: it takes less than 2.5 hours to turn a glass sheet into a packaged solar module! This is a big step towards making the Solar Journey a reality this Summer, because we still had some gaps to fill in terms of cash-donations for buying the discounted Ascent Solar modules. Besides the recent developments in sponsorship, we are searching for a location where we can construct the trailer. We visited the Alfred E Smith Career and Technical Education High School in the Bronx, to meet our friend Nate Wight and to discuss with him our construction plans for the project. Nate is involved in starting up a new School, the Bronx Construction and Design Academy (BCDA), which aims to educate their students with a curriculum full of topics on sustainability. A perfect fit for our project! I got a tour of the facilities and it seems that all the equipment is there, but we need to find a way to get the trailer inside... More news on this later. In any case, when Garrett comes back home from Germany on April 1st, it will be many weekends of hard work, and FUN!!! Our study on "EV range requirements and Driving Statistics" has been posted on TreeHugger.com and GreenCarCongress.com!!! In both articles, our Solar Journey project was mentioned and linked, which resulted in more website-visits and awareness of our project. Read the articles here: GreenCarCongress and Treehugger. Work continues on outreach... We've put a new flyer together, in line with our new color-scheme and 'look'. Thanks a million to our designer, Tim Seegers! Click here to view the awesome, all-new, slick poster. The new Solar Journey Flyer!!! 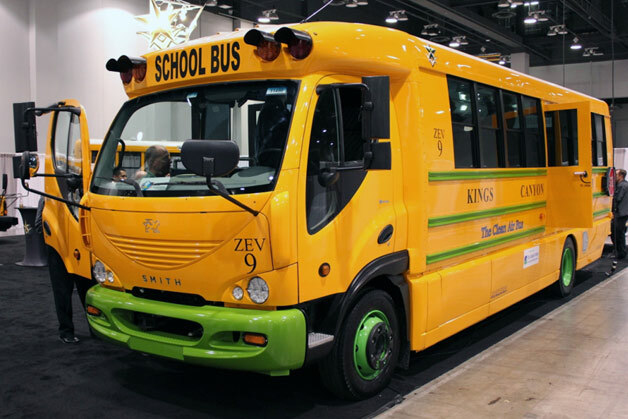 Something else, check out this electric school bus by Trans Tech! This is a great idea, as school buses always drive the same route and a fixed distance (no Range Anxiety). Besides that, it is the perfect way to make the new generation familiar with EVs! First of all, we wish you a Happy New Year and all the best for 2012! This is the year that we aim to travel across the country, so we have a lot of work (but also fun!) ahead of us. The solar industry has seen huge price-drops for modules in 2011, and 2012 is expected to be a year where more companies like Solyndra (you must have heard about that one) will drop out or merge. Installations for 2012 are expected to be approximately the same as last year (24 GW), although we have seen quick surges or drops in expected installations before, so this number comes with a big error bar. IMS Research expects installations to grow with about 5 GW per year after 2012. China is expected to grow even faster, gaining in market share of the solar industry. A couple hours before this post, China's LDK (solar company) bid $31.4 million for Germany's second biggest solar-cell and module maker Sunways, leading to a rise in many solar stocks. Takeovers and market speculations will continue to keep solar stocks' volatility high. How far do we drive? A brand new 'Theory' section is posted today, about the distance people drive with their cars and whether the limited EV-range is sufficient for these trips. We worked hard on this study and we believe it is worth checking it out here! Title page of the paper. The complete report is available for download here. The electric vehicle industry is also looking at an interesting year. In 2012, Tesla Motors is releasing their 'Model S', a beautiful all electric sedan with battery-options capable of a 160, 230 or 300 miles range. Watching this video got me very excited, I dream of driving a car like this! Other 2012 electric cars are coming out as well, including the Mitsubishi i-MiEV, Toyota RAV4 EV, Volkswagen Single-Seat EV and the Ford Focus EV. Fundraising remains a continuing effort, as we still need to raise a fair amount of money depending on the outcome of the conversations we're having with material sponsors. If you can think of any person or company who would be interested in supporting our project (and get recognition for doing so), please let us know! In these times, it is difficult to raise money for a non-profit project, but we are devoted to keep trying until we reach our goal! These are exciting times for Solar Journey USA... Garrett and I are currently talking to a 'big fish', who could become a game-changer in our project. Rumor has it that our whole project may be funded by this company... We have had a couple of conference calls with them and they really like the SJ-USA mission. Also, we have a new logo! Instead of the super-patriotic American flag that, as a Dutchman, I thought would receive great comments, we now have a hip, fresh logo. All credits go to Tim Seegers, my best buddy in Holland! These colors will be the 'brand-colors' that we plan to put in more places. We're exploring the idea to make a new website, which will make it easier to upload news and to have more structure in our SJ-USA lessons. Besides that, a new flyer will be coming out soon with the latest updates of our project. You will hear from us when we have more news! The all-new Solar Journey USA logo and our new polos! ASN bank competition: thanks for your votes, but we unfortunately did not win! We qualified for the final round in the ASN bank competition 'de Wereld voor Morgen', but we did not end up winning the grand prize. Another project received around 2,000 votes in a really short period of time and we sort of lost hope after we saw that... In the end, we gathered a total of 1,200 votes, 700 in the first round and 500 in the second round, and we would like to thank everyone for taking the time to support us! "Assessment of Electric Cars’ Range Requirements and Usage Patterns based on Driving Behavior recorded in the National Household Travel Survey of 2009"
What household characteristics affect the answers to the above questions (urban/rural, number of vehicles that household owns, household ethnicity)? Part 1 deals primarily with people's range requirements for electric cars and how 'Range Anxiety' plays a role in this. In addition, I dig into the uncertainty of range due to driving behavior, weather conditions and other factors that influence actual EV-range. Part 2 focuses more on the effect of EVs on the electricity grid, as this is my focus of research at Columbia. 1. Number of Vehicles per US Household: if people do buy an electric car with limited range, do they have to worry that they can not go on long trips (vacation, family far away, etc.) anymore? - The majority of households has more than one car (59%), so if the EV replaces one of their gasoline cars, they could take the other one for the occasional long trip. How often do people make these occasional long trips? Here's a distribution of single trip distance from almost 750,000 car trips recorded in 2009: Do you see how few trips are longer than 70 miles??? If an electric vehicle would be used for one specific purpose, it would likely be the daily commute. So I looked at the commute distance of over 100,000 people who commute to work. I selected only the people who commute by car! Pretty interesting stuff huh? Well, there are many more cool tables and figures, and I got a little carried away so I'm turning this into a nice paper that could potentially be published in a scientific journal. Next update will be soon, perhaps on our new website!!! Only two days after the interview, Columbia University's Spectator posted a nice article about the project. Read it here. A couple weeks ago, we chatted with Shayne McQuade, the CEO of Voltaic Systems. He saw potential in our project and sent us a Fuse solar charger as a gift. Voltaic Systems sells a whole range of solar charger products: they have laptop bags, backpacks and even iPad covers. The nice thing about these products is that they're so rugged, which is ideal for the outdoors. The small LED-indicator, melted into the company's logo on the product, lights up when the battery is charging. The monocrystalline cell technology allows for charging even indoors. Besides it being a handy device, we believe it is a great way for people to be introduced to solar energy, even though it is still somewhat pricy (the Fuse sells for $129). This is expected to come down significantly though as cell prices are dropping rapidly. The positive effect on attitude towards solar can lead to people investing in a PV array on their roof. The Voltaic 'Fuse', a 4-Watt portable solar charger that can be attached to a backpack/bike. It comes with a battery that has a USB-power output so you can charge your iPhone/Blackberry with it. ASN bank competition: thanks for your votes! We qualified for the final round in the ASN bank competition 'de Wereld voor Morgen'! (it means: 'the world of tomorrow'). This competition aims to spark young entrepreneurial minds for ideas that can change the world on topics like: human rights, lifestyle, fighting hunger and disease, etc..
Over only three weeks, we surpassed ~50 other projects (many started way earlier than we did) in a voting race. We received 631 votes (THANKS TO YOU ALL!) and made it to 2nd place in the sustainable energy group. There are many other cool projects on the website, many are worth checking out, like "A sunnier future for children in Namibia" (Google translated), a project that aims to educate children in Namibia on installing solar panels so that they have better chances to get a job, and to help rural areas with providing electricity. Other projects focus more on local issues that can be done, like "Join us, save the sea! ", an effort to stimulate people to help clean up washed up debris from the coasts of the Netherlands. You get it, besides the 5 projects that win the grand prize (~$15,000), there are many others that would make great use of this cash prize. Perhaps this competition will lure other investors so that other projects in the Top-40 can be realized as well! Unfortunately, my best friend Garrett has left for Germany, to do some methane-hydrate research for six months. Have fun in Berlin, buddy! Here is Garrett taking care of the last polar bear in the city suffering from global warming. Solar Journey USA will go on though, Skype is ideal for a quick update on our work and a chat about Garrett's explorations of maybe the best city in all of Europe. Except for the Netherlands, that is. Hot! Hot! Hot in New York City! Over 100 F in the last three days (that's 38 in REAL degrees). These are the times of high electricity demand in the City, with everyone running their AC's. In New York, most of the generation of power happens upstate, while the load center is in the south (NYC). Therefore, transmission is necessary, to transport electric energy from the power plants to our homes. And it's days like these that push transmission lines to their capacity limit, sometimes with enormous consequences. On August 14, 2003, a combination of high loads and human error led to the 2003 Northeast Blackout that affected 55 million people in the US and Canada. A cascading failure led 256 power plants to go offline, dropping the total load on the grid with 80%! Investigations concluded that the event contributed to 11 deaths and it costed an estimated $6 billion. In order to improve reliability of the grid, much effort has been put into reducing peak loads. If you live in NYC, this is why ConEd is trying to persuade you to turn off your appliances during hot summer hours. Weird right? ConEd makes money from each kWh you take from the grid, and now they want you to turn your AC off! I once received a text message from them, asking me to turn off non-critical appliances. Another way to reduce loads on transmission lines is by generating electricity at the receiving end of these lines. This is the power of solar: during peak loads it is hot, and when it's hot, the sun shines.. Some people even argue that significant amounts of solar PV in New York City could have prevented the 2003 blackout. Enough about electricity: lets talk about Solar Journey! - Garrett and I now have a gift-account through Columbia University, which allows for tax deductible donations!!! Yes! We have our Non-Profit account! In addition, Jeffrey Leonard, CEO of the Global Environment Fund, has announced a challenge grant to new corporate sponsors: he will match his own sponsorship 1:1 with whatever amount they donate. This is really a great push for us to put extra effort in finding new sponsors. Thanks Jeff! As for other news: we are preparing our PV array and experimental setup to be used in a class called 'Photovoltaics Systems Engineering', taught in our Engineering School. Garrett and I will teach students about how to design and install a stand-alone PV system. After that, they will be doing an experiment on the performance of the Maximum Power Point Tracker (MPPT). We are pretty excited about this, we believe that small solar PV systems are a great way to introduce students to clean power generation. Work is still in progress for the US driving habits report, compiled with the Household Transportation Survey results. We wanted to publish a report on people's average daily driving distances so that conclusion can be made about whether electric cars would suit their needs. I hope to publish that next week. But for now, enjoy your vacation and the sun! Our solar panel setup has again been reduced in size: it now fits into a backpack! We brought it out to Central Park where our first 'Angel Investor' dropped by for a talk and some pictures (Thanks RobDAD!). We also brainstormed about ways to integrate solar into products, and how to design a portable solar generator as good as possible. With the summer on its way, we spent more time outside with our panels. In this newsitem, we will give you a quick update of our progress collecting donations, some challenges we foresee regarding the !wind! and we have a video of a test we did on a solar module from the seventies. But we will start with some graphs I created about U.S. driving habits from the National Household Transportation Survey of the year 2010. Our new 'compacted' version of the electric components. The MC4 connectors connect to the solar panels. Would an Electric Car fit your driving habits? Everybody knows that electric cars have a limited range. Like ‘Horsepower’ and ‘0-60 in x seconds’, the metric of ‘Range’ has been added to the list of car’s specifications. Or, at least EV’s specifications. Most electric cars have a range of up to 100 miles (like the LEAF), with one big exception (the Tesla Roadster). In a recent poll about electric cars by Deloitte, 80% of the U.S. participants of the survey want a range of 100 miles or more from an electric car. Around 60% of them want to be able to drive at least 200 miles before a recharge and 37% expects a range of 300 miles or more… With the fear of being stranded on the side of the road (a new term was born: ‘range anxiety’), people are holding back from buying an electric car. The limited range is actually somewhat exaggerated by the media and people appear to have a flawed understanding of their daily driven distances. The Nissan LEAF fuel economy label by the EPA. The LEAF is expected to get 99 MPGequivalents, and a 73 mile range (the latter has received a lot of criticism since it depends a lot on driving habits). Do people actually know the range of the car that they’re driving themselves? If you look at the range of the 10 best selling cars in the United States (2010), you find that 4 out of 10 show a range lower than 300 miles... This is quite surprising, especially regarding the above survey results. Do you ask your dealer about the range of the gasoline car you're buying? The above 37% probably should. Now, it is true that gas cars take less time to refill, but soon more 80%-charge-in-20-minutes stations will open up. So what I've been working on is to generate graphs of driving habits of people in the U.S., using the 2010 National Household Transportation Survey Results and a statistical package called SPSS. Here's a quick preview for you; I hope to publish a bigger report on this website in a week or two. Questions I'm trying to answer are: How many cars drive less than x miles per day if they're used that day? How many miles do people commute to work? What are the differences per State in terms of driving habits? etc. Let me know if you have any other ideas! Garrett and I brought our panels to the roof today, because we wanted to refill our batteries. After we put the panels flat on the roof, a windgust blew all of them away! We were glad it happened while we were there, otherwise they might have become damaged. Obviously, the top of a roof is not a wind-free location, but we should definitely take this into account when designing the big array. Maybe some ground hooks (or Dutch: 'die goeie ouwe haringen') would turn out to be handy. Other News: a 1972 ARCO solar panel tested! Module testing by the JRC European Commission, Institute for Energy. Link here. Pretty cool stuff! Even the earliest solar panels produced show very little degradation over a long period of exposure. Thanks to all the people who have donated! In the last couple of weeks, we've raised an additional $300! Our total is now $25,633! We are still looking for more corporate sponsors to help us out, so if you have any ideas (friend's company, sister's CEO, etc) let us know! All the best and enjoy the weather! It's been a while since our last post. As many other students, we also have end-of-year responsibilities like finishing papers, final exams and running overnight experiments. We've witnessed many sunny spring days wishing we were outside on the lawn with our solar panels and music. However, on April 21st, we saw the opportunity to log a perfect solar output curve and we took it. Since sunrise was expected to happen at 6:09 AM, we got out of bed at 5:20 and we were all set on the lawn at 6:20. With the sun still behind our campus buildings, we drank a Starbucks coffee while the computer displayed our output: "0 Watts". Then, at 6:31:33 AM, it jumped to "1 Watt" (i.e. an iPhone, browsing the web). Garrett and I high-fived and had a small celebration! In the 40 minutes after that, the output slowly rose to 3 Watts (i.e. LED light bulb) because we still didn't get any direct sunlight on our array. But then, at 7:24:56, the shadow over our array started disappearing and in the two minutes that followed, output rose to 14 Watts (i.e. small Netbook laptop). In the curve below, you can see how the output changed over time. In the morning, we had a bunch of clouds covering the array from time to time (output drops to around 20W), and later in the afternoon we had people casting a shadow on our array (reduces output by ~30%). Also, we broke a record that day! At 12:11PM, we generated 135 Watts for a couple of seconds. This is exactly the rated power output of our panels and it shows their great performance. Typically, you wouldn't expect to generate that much power in April in NYC. The reason it can still happen is pretty interesting. I invite you to look at the graph for a minute and try to figure it out before you read on (one hint: think about light reflection). If you look at the output from 1PM to 4PM, you see that the output is pretty steady. This is because there are no clouds in the sky at that time. When you look at the morning curve though (more clouds), it seems that some datapoints shoot up to above the maximum line you would expect... And this is the reason why that happens: clouds may reduce the output while they cover the sun, but when they are not covering the sun they work as reflectors and increase the output! When the conditions are right, this might increase the power output with 15% compared to an 'empty' blue sky. We generated 649 Wh during the ~10 hours we were outside. That’s about 4.8 hours of full sun. The capacity factor for the time we were online is 0.49. Other News: the first article about Solar Journey USA! Three weeks ago, we were contacted and interviewed by the founder and editor of SolarChargedDriving.com. He posted a really cool article about our project on his website that you can read here. We hope to get more external articles published so that we get the word out about our trip. There is a way that you can help at zero cost: by simply sharing this website on Facebook! We've gotten sponsors because of people sharing the link to our website on Facebook and Twitter. Please contribute! Also, next week, we're hoping to bring our system to Central Park. An email will be sent out to our mailing list with information on where we will be and at what time! On Saturday morning, we woke up early to bring the small solar array out for a day of testing. After buying some additional fuses for the inverter, we had everything set up at around 11:30am. We figured it would be nice to get used to the equipment and the performance of the array. Besides that, we would get the opportunity to talk to some people about the Solar Journey, hand out some flyers and blast some zero-emission music! The highest recorded output that day was 120 Watts! And since the sun is not at its highest point yet in April, that is pretty high for a 135 Watt system. We generated about 310 Wh during the ~5 hours we were outside. That’s about 2.3 hours of full sun. The capacity factor for the time we were online is 0.49. We will include a section on Energy Yield and the Capacity factor in the Theory section soon. Below you see two graphs that show the output for that day. The one on the left shows the actual output (which includes many dips from clouds) and on the right is the maximum output for every 10 minutes. The green line represents the cumulative generated electricity. Graphs of the PV generation profile on April 3rd. Click the graphs to enlarge. As you can see, it got quite cloudy after 1pm… Notice how we still got very high peaks during the afternoon: this happens when clouds are not covering the sun, but all around they refract light from the sun. For our next test, we want to bring out the array when weather forecasts are better, so that we can log a steep rise in the morning and have a smoother curve. We might do this on a sunny day in central park, where we can talk to even more people about our project. As for other news, we’ve been contacted by Charlie Garlow, the inventor of the FunRunInTheSun. He also plans to travel across the country, in a pretty nifty little EV, with his dog Rex! Check out his website. He asked if we could come by Washington DC on our trip, so that we could collaboratively do an event for EV’s powered by the sun. Besides that, we’ve contacted JB Straubel, co-founder of Tesla Motors. He installed a hitch on his own Tesla Roadster and has used it to tow a new refrigerator to his house! In the last update we introduced our lab scale PV system that we constructed to test two MMPT’s and get familiar with the thin-film Ascent WaveSol panels. We have been getting some nice weather over here in NYC, with special thanks to the weather gods. This has allowed us to bring the system out on campus and test its performance. To better demonstrate the use of solar energy we brought a small sound system from which we played music while charging the battery and collecting data. We figured music would attract students and initiate a conversation. It worked surprisingly well! People quickly realized that they were listening to zero-emission music… Sound waves were never so pleasant! We attracted a fairly big crowd around our panels in front of the Engineering building and answered questions regarding the Solar Journey USA project and solar energy in general. People asked about the panels’ efficiency - we said: “around 10%”. They asked what technology it is – “CIGS: Copper Indium Gallium di-Selenide” and they wondered where and when our first big zero-emission party is – “Low Memorial Steps, maybe next weekend. Sign up for our newsletter and we'll let you know." 3d rendering of the 7kW array which will be charging the EV. The three panels on top of the trailer are the ones we tested today. For more renderings, click here. The weather man tells us that the rest of the week will be rainy and maybe even bring snow. Not the ideal conditions to test a solar array. When the sun comes back out we plan on conducting a full day test of the panels to see their morning and evening performance. We will be uploading the production and performance curves of this test on the website as soon as we have them. If you’re around NYC early next week and want to see our panels in action, sign up for the newsletter and we’ll update you on when we will be out on the steps of Low Memorial library blasting music and charging anyone’s batteries who wants to get some free zero-emission juice from the sun. Ow, by the way, here is an earlier video (St. Patricks Day) of Garrett explaining the solar array. And this is the link to our complete guide to design and build one yourself! We have some exciting news since our last update. We have constructed a lab scale PV array that we will use to test a few Maximum Power Point Trackers and other components of the system. Since the sun is out more these days, we will bring it outside and let students charge their phones. Solar Garrett at work in the lab. And a large piece of plywood to mount everything onto! It’s actually surprisingly simple. The entire system will be monitored via a laptop running a piece of Solarview software which will collect data on the systems voltage-current production as well as the state of charge of the battery. We are currently putting together a more in-depth review of this system (and how to build it) to which you can look forward to in the near future. We are awaiting a sunny day here in Manhattan so we can bring our system out to the steps in front of the Columbia library and test our very first solar array, exciting stuff. Students will be able to charge their phones with solar electricity for free while we chat with them a little bit. In other news, we have received our official quote for the full 5 or 7 kWp system from Ascent based on the Wavesol 5 meter panels. With this quote and the availability of the 5 meter panels we can begin the final design stage of the trailer and electrical system. We also have potential good news coming from Intel, we have spoken with a Software Engineer team leader regarding a sponsorship of a big part of the remaining necessary funds. If this turns out to be a go then we will officially be breaking ground on the full system in the coming months. Besides that, we have received other generous donations from our friends and family members. Thanks for helping us get closer to our goal! We are sure that everyone will enjoy our mini-lessons and we love educating, so the more people that see our site the happier we will be. Thanks all for keeping the interest alive, and please share with your friends, even suggest they donate and mention in what ways you go green besides supporting a unique and unprecedented project like Solar Journey USA. Last weekend, a small delegation (Garrett Fitzgerald, Sander Mann and myself) visited a stand-alone solar array in Brooklyn, just across the East River. David Gibbs, NYC's expert on battery-connected PV systems, gave us a tour and explained how he engineered this solar PV system. It was beautiful to see and learn about how this structure provides power without being connected to the electricity grid. You can find some cool pictures and videos in the next paragraph. He also gave us some advice on our 'solar shopping-list' for the experimental setup. Besides this trip, we also worked on a new lesson. This one is about batteries for electric vehicles. Do you know why the Prius only uses ~15% of its battery capacity?? Output - To either load (EV) or batteries. The system is built by the Beautiful Earth Group, a company with a mission to produce clean, sustainable energy that can be used in industrial production and processes. The company was launched in 2008 and has a global outreach. One of the ways in which they hope to complete their mission is to build mobile charging stations for electric cars. There's a lot of potential there... Below is a short summary of our tour, which was given by David Gibbs. The whole system basically consists of 2 big containers, a solar array plus mounting rack, batteries, inverters and maximum power point trackers (more about those next week). Inside the container, David explained us how he designed the array and electrical components. It is important to design the batteries and solar array in a way that you minimize losses. This is done by parallel- or series-coupling the panels or batteries. If you couple them in series, you add up their voltages (two 12V panels in series become 24V). If you connect them in parallel, you add up the currents that each panel generates. Preferably, you would design your system so that the voltage over the batteries is about as high as the voltage over the panels.Besides explaining the electrical configuration, David showed us how to recharge the electric Mini EV which was parked in the container. You can see how simple it is in this video. The batteries that store the electricity generated by the array are in a simple ventilated box. There is no need for expensive li-ion batteries in this case, because the weight of the batteries is not important. David therefore used simple lead-acid cells. These are similar to the ones you find in your car, to run the lights and radio when the engine is off and to provide power to start the engine. The Mini-EV however, is equipped with li-ion, because its battery pack has to be light in order for the car to have good handling. When we arrived at the mobile charging unit, it was cloudy. The array was producing only 2 kW. When the sun came out, we saw the output increase to 3.5 kW. The system offers a range of possible outlets, including normal 110V AC outlets, a high-voltage connection to the Clipper Creek EV charger and some smaller 48V golf cart chargers. Also, we have uploaded a new Lesson to our 'Theory' section. Click the link below to check it out! Last week, we finished the rough interior design of the solar trailer for the electric car. Long sheets of electricity-generating solar panels will be unrolled from two 18-inch cylinders in the trailer. In total, we will carry 55 square meters of panels with us, enough to drive at least 160 miles per day. More pictures can be found in the 'Design' section. Happy New Year! 2011 is here! This is the year of the Electric Car, as many car manufacturers launch the release of their first EV's! With all of the car manufacturers competing for the lowest EV-prices and highest ranges, it is the perfect environment for innovation and implementation. Among the 2011 EV's manufacturers are: Subaru, Coda, Jeep, Mitsubishi, Ford, Honda and Dodge. Note, this is only a small selection. For a complete list of electric cars and specifications, visit allcarselectric.com. With a total of 1,245 miles out of 3,200 raised in donations, we are making good progress. However, we've set the goal to get to 2,000 miles by the end of January. Will you help us get there by donating or sharing this website with others? Without you, the Solar Journey can not succeed! Any help is appreciated. Please check out our first 3D designs of the vehicle. In the next couple of days, we will show more of what's on the inside of the trailer. Stay Tuned! The first two lessons of our PV for Dummies online course were about photons and solar cells. Now, we will discuss the difference between power and energy, something that is important to understand for the future lessons. We keep finding wrong interpretations of these two entities, so with this article we hope to get rid of all the confusion and make sure that you understand the difference! The President of the Global Environment Fund, Jeffrey Hugh Leonard, donated a generous $10,000 last week. This means a giant 500-mile leap towards our goal of crossing the country with solar power (we're basically halfway there!). Now, the only thing we need is the electric vehicle(s); one month of borrowing an electric car or two electric motorcycles will suffice. We are looking for ways to get in touch with electric vehicle companies like Nissan, Chevrolet and Brammo. Any ideas? This week, we also wrote the second lesson in our PV for Dummies course. In lesson 1, you learned that light consists of energy packets called photons. Now, lets look at how a solar cell can convert this into usable electricity! On Monday morning, a big box arrived in our department with 'Ascent Solar' tape wrapped around it. Excited as I was, I signed for it and picked it up: the box didn't weigh anything! I brought it into the office and people gathered around to see the first sample panels Garrett and I received for our project. This REALLY marks the start of the USA Solar Journey. When I took the panels out, I realized how thin they are, but at the same time sturdy. The best way I can describe them to you is: they're like giant creditcards with two strings attached. A little bit more sophisticated description would be this: Thin film Copper Indium Gallium (di)Selenide (CIGS) deposited on a plastic substrate. The panels each have an output capacity of 45 Wp (Watt-peak) and an open-circuit voltage of 48 Volts. This means that in full sunlight, a single panel would be able to power 4 Macbooks (idle, display on). Ascent Solar is the only manufacturer of thin-film CIGS on plastic substrate. Their panels are therefore super-lightweight and flexible: ideal for our use! Below you find the first lesson of our little online solar photovoltaics physics course, explained in the simplest way. Title: "Drive across the US, no CO2, for free!" Last week, we had a meeting with the Dean of our School. He was very impressed by the idea, but he brought up a couple of important things. First of all, he wants the project to represent Columbia Engineering, thus include some of its research related to it. Garrett and I are now working on a research proposal, that is carried out along the trip across the country. His second important point was about safety. For this reason, we are now also working on a trailer design that works for an electric car. So instead of using two motorcycles, we can drive a car instead. This might actually appeal more to the public and we'll be inherently more safe. It would be great to have our school connected to this project, because that will help us find more sponsors and it will make it easier to reach out to as many people as possible. The people we met during the meeting were very interested and helpful, especially Holly, who does all the outreach at the Engineering school. We hope to hear back from them soon, so that we can make a final decision on the vehicle we want to use. If we use a car, the lay-out of panels in the trailer will be completely different. So we're working on that right now. In a week or two, we will come up with some cool 3D renderings of the design. You will find them on our website ASAP! Sponsoring: we've raised $14,490 already! Now a quick update of our donations so far. Big news came in last week that Ascent Solar will be providing us the panels we need for the trip. They are sending us some flexible panels that we can experiment with. They will arrive in a couple of days... Yesterday, we heard from Professor Themelis that the Earth Engineering Center is sponsoring us 50 miles = $1000! In order to acknowledge these kind donations, we started a special section for them on our website. So that means we've raised almost a quarter of our trip already. Will you help us share this with others? You can post our link on facebook, for instance! Next week, we're going to a Tesla Motors event where we promote the Solar Journey and we have a meeting with people from Yodle, an online advertizing company. They might help us reach out to other corporations. Also, we will include more information about the technologies we use in future news items. Today, we met with Dean Pena-Mora of Columbia Engineering. It was a great day to reiterate what we've done so far. If I look back at what we've done since September 20th, when the idea was born, I get excited for what is yet to come. So we did the calculations and figured it would all work out. You can read more about the calculations in the 'Design' section. From the initial drawings I made on the first night, we made some changes and drew the trailer in a 3D-modelling program (Pro-Engineer). Of course, this is just a preliminary design, it only shows the main idea! The actual trailer is going to look much cooler! We then started designing a pamphlet that we would send out to interested people. Two weeks ago, we received the hard-copies and we are now in the process of collecting mail addresses and licking the stamps. Let us know if you want one! We handed a couple of these flyers over to the Dean and his advisors: they were very impressed! Right now, we are waiting for their decision on a possible collaboration which will help us with fund raising, getting media attention, maybe machines and a location to build the trailers, etc. Also, we went to Denver to meet up with Ascent Solar (manufacturer of flexible CIGS solar panels). We hope for a collaboration with them so that we can promote their technology on our trip. We will talk a little bit more about this technology in future news items. Right now, the most important thing is to get the word out, and you can help with that! Share this page on facebook, email it to others, tweet it to your followers, etc. In any case, sign up for our newsletter if you're interested!